The world was cookie cutter ready for an alien invasion. Xenophen leveraged humanity's growing into a knowledge economy. To control us, they simply needed to offer a better education. Meet Ruth; a homeless woman whose only means of survival is serving humanity's destruction. As she sees mankind's noose slowly tightening, she scrapes for any means of escape. She flees with restricted knowledge, in the hope it can unravel our doom. 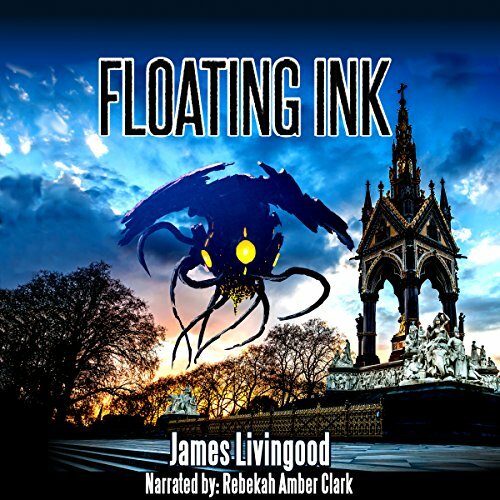 In Floating Ink, Echo on the Water by James Livingood the alien (called Xenophen and resembling floating ink blots) invasion is in the form of educating the humans to be able to accept and use advanced technology. Insidious floating beasties, as I suspect there is more to come in future editions of the series. Fortunately for mankind a woman named Ruth develops some unexpected and interesting abilities that trigger her curiosity, cause confusion and slowly broaden her understanding. I enjoy this different slant of an alien invasion and appreciated receiving this book in exchange for an honest review. The beginning of this story is very visual and entertaining. We are introduced to Ruth just prior to the Xenophen invasion, the story opens with, “Ruth was the queen of rats and the trend setter of black soot stains.” And even though I winced a bit at the mention of her cockroach subjects in the next sentence I did snicker. Narrator Rebekah Amber Clark has a nice range of voices. She definitely got across the variety of emotions that Ruth underwent during this short story. I also enjoyed the mechanical alien voices, perfect. Definitely an interesting book. I was a bit lost on the reality bubbles but I enjoyed a new take on alien invasion. Looking forward to book 2 and hoping to find the reality bubbles explained. Good narration by Rebekah Amber Clark. A new take on alien invasion! Ruth, once an orphan living on the streets, became employed by the aliens that invaded Earth. The Xenophen made her a Caretaker, giving her special abilities. Even as she appreciates her security as an adult, she still doesn’t trust the Xenophen. She stumbles upon an odd pattern in a series of numbers. Under threat from the Xenophen for her discovery, she flees! Once again, James Livingood brings to us a new take on an old theme: alien invasion. Opening on an outdoor celebration, the story shows a young Ruth organizing and putting to use scraps of things. Then the unexpected aliens, which look something like giant floating ink blots, come and change everything. At this point I was intrigued but still expecting a pretty straight forward alien invasion story. The story flashes forward a bit and now a young adult Ruth spends her days in service to the Xenophen. She’s not happy about it, but a chunk of humanity is in the same boat as her, like her human boss. When Ruth comes across the peculiar code and reports it, she is immediately visited by a Xenophen. It makes it’s threats clear – her Caretaker abilities will be taken away (which could be quite messy and potentially fatal) if she pursues this any further. At this point I want to give a nod to the alien tech incorporated into this story. The Xenophen use some sort of ‘bubble’ tech that allows Ruth and other human workers to float info in front of them while they work, like we would have several computer screens up in a control room. Also, flattened bubbles act as platforms that carry the workers around, like very fancy elevators. This was all well done in such a short story, the author using imagery quite well to get it across quickly to the reader. Yet one more thing goes awry and Ruth’s old street instincts kick in. She flees into the nearest woods. There she meets Henry, a well-meaning if a bit judgy sort. While he’s only in the story briefly, he serves as an example to Ruth of what it is to live away from the Xenophen influence. From here on out, things get weird, in a good way. Ruth is on a strange and wondrous adventure, if at times a bit scary and confusing to her. Ruth meets more unusual people in her journey and by the end, things may not be as we think it is. Or perhaps that is just one more trap laid by the Xenophen? The story ends on an open note, leaving me ready for the next installment. I received this book free of charge from the author. The Narration: Rebekah Amber Clark’s narration is fantastic. She does this multi-voice thing for the Xenophen. Also, Ruth’s voice ages as her character does. Clark even went to the trouble to make a PA announcement sound like it was really coming over a PA system. I love it when narrators make these little extra efforts on short stories!